Western influenced clothes always pop on on the Fall runways. Be it in the shape of a boot, the stitching on a jean, or the flop of a hat, everyone likes a little cowboy when the temperatures start to drop. 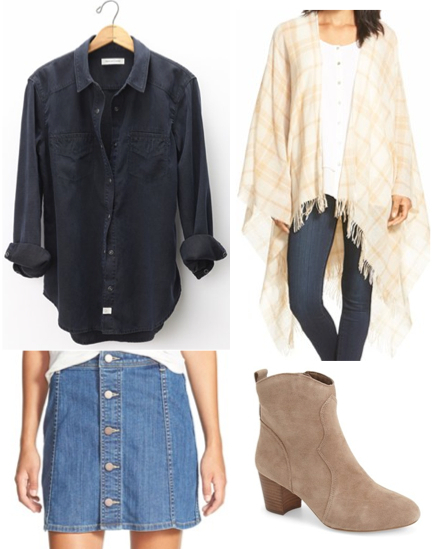 Below are some great options to incorporate into your closet as well as your man's this Fall. 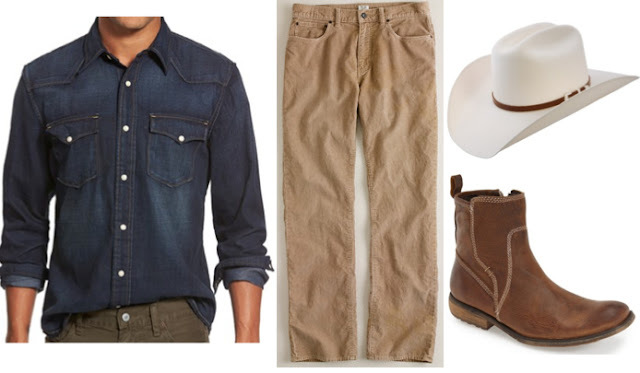 And for those of you that need to go full blown outlaw for the upcoming Barn Dance benefiting Women's and Infant's Services at Advocate Good Shepard Hospital, I have put together full looks to get your two step on in style. The event is being held at The Barn next to Advocate Good Shepard Hospital in Barrington on Saturday, October 17th at 6:30pm. You can purchase tickets here, it is going to be a great time. 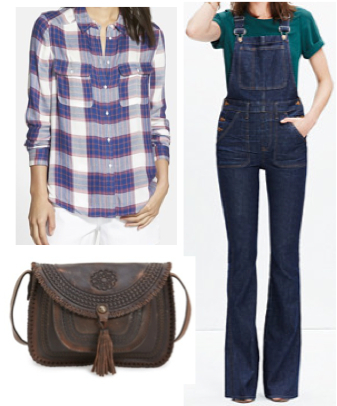 Overalls can seem extra 1997, but the new styles like these from Madewell are cut so well and flattering. Would sport them anytime. This flannel by Paige would also go great with skinnies all Fall long. A rugged cross body bag is a fun alternative addition to errand running. 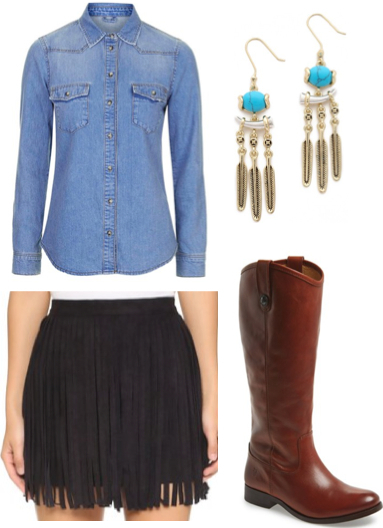 A tucked in denim shirt looks so fun with this suede fringe skirt. I also love the touch of turquoise in these earrings. The Frye boots have just a touch of cowgirl to them, but could be worn with anything. I have three denim dresses on heavy rotation right now. The perfect Fall staple and this option from the Gap is a nice color. 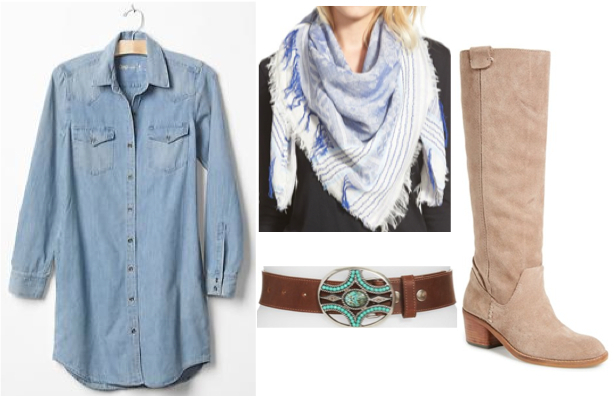 Pairing it with a pretty scarf and turquoise belt Obsessed with these suede boots. The color and shape are perfect. You can do denim on denim, ladies. A dark wash denim shirt tucked into this medium wash mini skirt is so fun. A fringed cashmere poncho (comes in other colors) is now at the top of my wish list. And these short suede boots are easy on, easy off for running out the door. 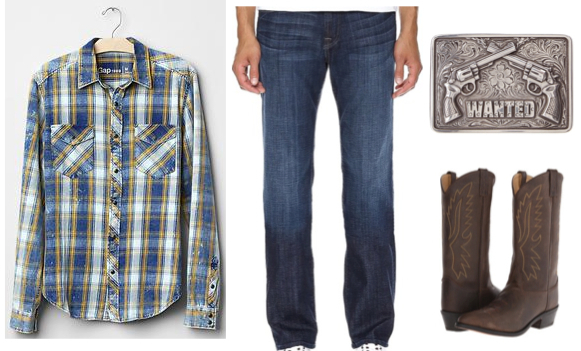 When you add cowboy boots to a classic flannel and his favorite jeans, suddenly you swoon a bit more. Just add this belt buckle to go full cowboy. Loving this dark wash denim shirt with some worn in thin cords. These boots are just a nod to Western and could be worn all season. And a classic white cowboy hat, hellloooo.